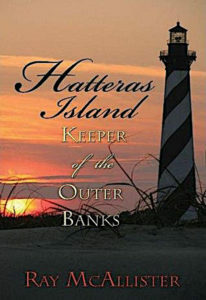 Hatteras Island: Keeper of the Outer Banks, $19.95 hardcover. ISBN 978-0-89587-364-4. Pub. 2009. 5-3/8 by 8-1/4 inches, 297 pages, 80 B&W photographs, maps, drawings. In Hatteras Island: Keeper of the Outer Banks, award-winning coastal writer Ray McAllister returns to the site of his family’s annual vacations a quarter-century ago. Much has changed on Hatteras. But even more has not. Elsewhere, fast-food restaurants, strip malls, and beach-dominating duplexes have overcome resort islands. But the storm-buffeted Hatteras has kept its soul. For a remote patch of real estate with a year-round population of little more than 3,000, Hatteras has witnessed extraordinary. It may have been the destination of the Lost Colony. Blackbeard likely hobnobbed with the locals. The Monitor went to its watery grave nearby. Radio towers on the island made history’s first transmission of music and received the distress call from the Titanic. Billy Mitchell proved the ascendancy of air power by sinking a pair of mothballed battleships offshore. Bodies washed up on the beach following U-boat attacks during World War II. The surfmen of the island’s lifesaving stations made some of the most heroic rescues ever. And the coastal icon, the Cape Hatteras Lighthouse, has stood watch. But Hatteras Island: Keeper of the Outer Banks is more than a history. It is rather, as author Ray McAllister says, “a conversation with an island.” It tells of a vacation paradise that can change instantly into a storm center, of a resort island kept largely free of development — but hardly of controversy — by a national seashore park. It tells of the hardy few who brave the Hatteras winters, those who come to catch record-sized fish from the piers, those who travel disaster-prone Highway 12 and who drove the bare sand before it, those who stood and watched as a 208-foot lighthouse was moved half a mile. —THE COASTLAND TIMES, MANTEO, N.C.
“Brimming with history, [Hatteras] is also a relaxed and relaxing place where beach-lovers can find. peach. 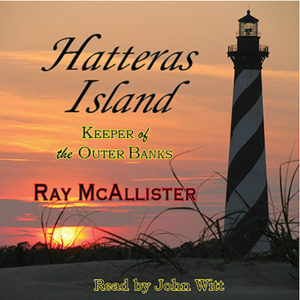 As such, McAllister, though writing of Hatteras’ long history, instead calls this book a “conversation with an island.” It’s a conversation to be savored, in a hammock at a beach house in July or under a blanket in an armchair in January.